This Microwave Apple Cinnamon Roll Cobbler recipe is the perfect treat, and you can whip it up in just minutes using Rhodes Microwave Cinnamon Roll Dough. #ad – This recipe has been sponsored by Rhodes Bread. As always, all opinions are my own. What’s better than gooey cinnamon rolls? How about a Microwave Apple Cinnamon Roll Cobbler that tastes like an apple and cream cheese danish? Yes, you read that right – you can make this in the microwave! It’s so very delicious – you’re going to love it! The secret ingredient is just a bit of cream cheese that adds to the decadence of this delicious dessert or brunch dish. Keep this recipe handy, it’s going to be super popular with your friends and family, trust me! I love having dishes like this that are easy to make for a lazy Sunday morning. Sure there’s a little work to it, but the result is well worth it. And since this is a Microwave Apple Cinnamon Roll Cobbler there’s no kneading or rising, so you’re not waiting forever for this deliciousness! Microwave Apple Cinnamon Roll Cobbler is a delicious addition to brunch, or a delicious dessert. 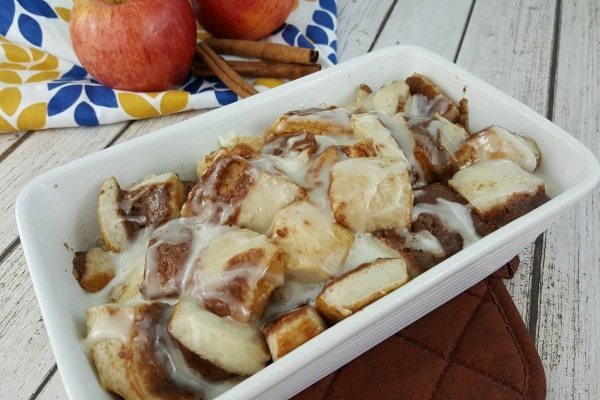 Your kids will love this sweet cinnamon apple treat! Remove the Rhodes Microwave Cinnamon Rolls from the freezer and let set at room temperature while you prepare the rest of the recipe. Grease a small microwave safe dish, set aside. In a large skillet,melt the butter over high heat. Add the apples, cinnamon and sugar. 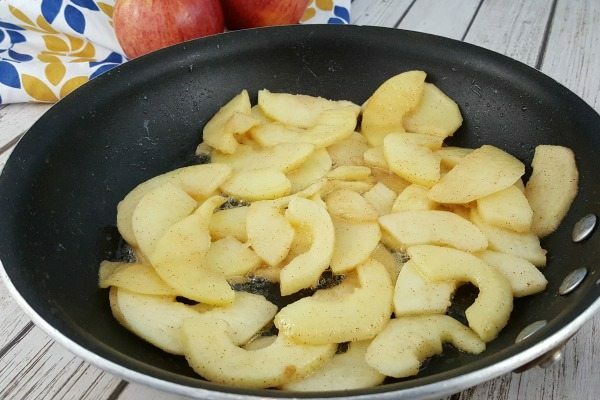 Cook until the apples are tender, about 8-1o minutes. Add the cream cheese and stir into the apple mixture. Pour the apple mixture into the prepared pan. Using a sharp knife, cut each cinnamon roll into 6 pieces. Arrange over the top of the apple mixture. Microwave for 4-5 minutes until the cinnamon rolls rise. Drizzle with icing and serve hot. What Kind of Apples Are Best?